TEXAS FARM BUREAU INSURANCE HONORS DESERVING STUDENT-ATHLETES. Dave Campbell’s Texas Football has partnered with Texas Farm Bureau Insurance to shine the spotlight on some of the most deserving young people in Texas Football with the Unsung Hero Award. Students honored are presented with an award at their school’s pep rally and Friday night football game. In addition to the award and special recognition on TexasFootball.com, each student will receive $500 in scholarship money as an Unsung Hero recipient from Texas Farm Bureau Insurance. Congratulations to all of the winners! When asked to pick a player on his team that would fit the mold of the Dave Campbell’s Texas Football Unsung Hero Award, it took Flower Mound Marcus head coach Gerry Stanford about a nanosecond. As in A.J. Wozniak, the senior football player who appears to be an even better kid off the field than on it. And we’re talking about a First Team All-District type talent here folks. “A.J. is a great kid. He’s a great leader. And he truly embodies everything this football program and our community is all about,” Coach Stanford says. 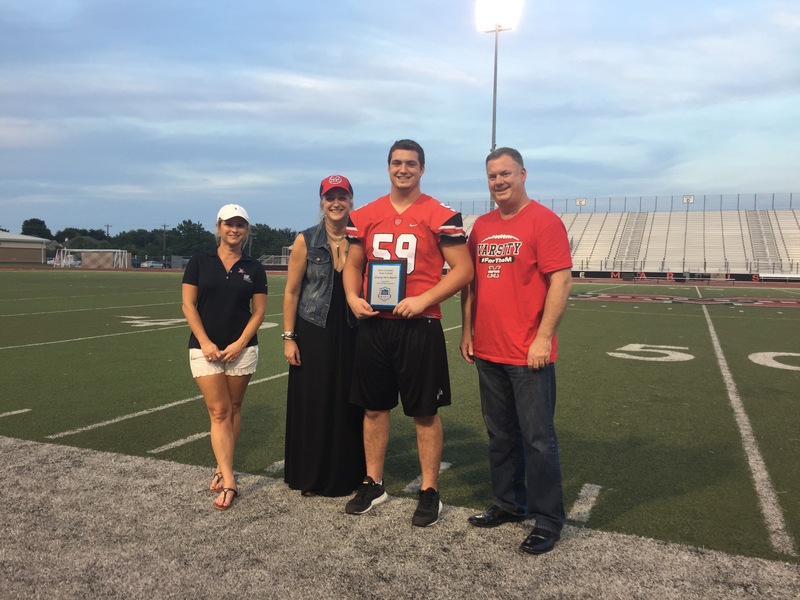 Wozniak received his special honor in front of a packed community pep rally leading up to Marcus’ Homecoming game. Along with a nifty award plaque, A.J. also will receive $500 thanks to Texas Farm Bureau Insurance to be used at the college of his choosing. Whether it’s leading his vacation bible school for the past three years, being a student leader and ambassador for his discipleship group or doing missionary work in Germany, A.J. works just as hard in these endeavors as he does when blocking and tackling. His active participation in the LaDainian Tomlinson Leadership Academy has carried over to him becoming a true team leader for the Marauders. As one of only five young men to earn the honor of Unsung Hero this Fall, A.J. certainly is a worthy choice.